You’ve worked hard on your website by putting hours into creating and marketing only to see visitors aren’t turning up to your page. You want results. You know you have a great product and your services are spectacular — why isn’t your website bringing in more leads!? SEO is the key to opening your online sales funnel. Do you know if your SEO is hitting the mark? Do you even have SEO? Don’t feel intimidated. You need a strategy to get your customers to see your website. Let us break down the basics in an easy to follow download and get your SEO started on the right path. For a limited time, SonFisher is offering new email subscribers our Search Engine Optimization Checklist, FREE for download. This is our essential guide to optimizing and crafting your website visibility the right way. When your site is ready to launch, be sure you have the SEO basics in place. With this list you can verify the strongest elements of search engine optimization of your website for yourself. It’s one thing to believe your website is doing it’s job, but it’s another to know if it is. 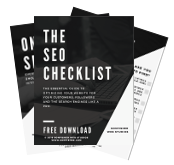 Subscribe to get your free copy of our SEO Checklist, plus get great web tips and stay up to date with SonFisher (approximately two emails a month). Just fill in the form below, verify your email address and you’ll be sent a link to download our free e-book.